Hi all! Happy Thursday! I have my work holiday party tonight. I am quiet excited because it has finally encouraged us to finish decorating and clean up our office. For me a clean and inspiriting work space makes all the difference when trying to create new ideas. 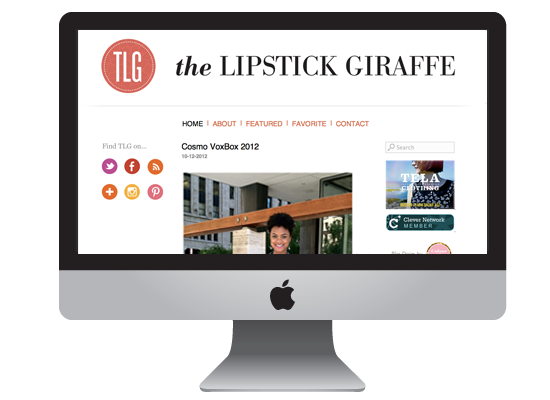 Speaking of new ideas, I recently finished a new blog design for my friend Kachet of The Lipstick Giraffe. This was a fun process because like myself, she enjoys clean and simple layouts. So we we’re definitely on the same wave length during the creative process. If your not following her yet, what in the world are you waiting for?! She’s always got awesome beauty and fashion tips. If you are looking to spruce up your fabulous blog drop me a line in the comments! I will begin accepting new freelance projects in January 2013! I will try and snap some photos of the newly re-vamped office tonight. P.S. we got a new arcade game I couldn’t be more stoked! I’m thinking of rocking whites and golds at tonights soiree. Hope you all are enjoying the holiday season. What are you looking forward to wearing for the upcoming holiday parties? Not bad at all. That’s a pretty clean and awesome layout!